Pinch punch first of the month! It's October and it's officially well into Autumn, and I couldn't be happier because I love Autumn/Winter dressing, the rich colours, the heavier fabrics - it all gets me so excited, but with a New York trip and a DLP trip early next year I can't really afford to go crazy on what I'm buying without a plan - so I've picked out some bits and pieces that either work together or with my existing wardrobe (or both!) to make sure that when I'm buying things for my favourite seasons I'm not wasting money! I'm pretty guilty of buying up lots of dresses and going out things, but not a lot of day to day clothing - but this year I am definitely going to try and be better! The first jumper, with the swans on it, is from Oasis and was merchandised in store with the tartan skirt I've placed underneath it in this collage. it's very cutsey and I think it'll go nicely with my Ted & Muffy boots from last year, and ultimately I'm aiming to buy things that will slot in and work with my existing wardrobe. Speaking of my existing wardrobe, the green Kate Spade handbag that I showed in this haul is one of my favourite bags - it's the perfect size to be roomy enough to hold things without being so big it ends up weighing a tonne, and green is my favourite colour so I'm on a mission to add a little more of it into my wardrobe. This green skirt is cord, which is a good material for going into the colder months as it is slightly warmer. The dress next to it would also be good for a layering piece in winter and it comes in both green and burgundy - which are basically my two favourite colours. They're logng enough to be able to wear to work with tights and a shirt underneath, but i'd wear them on the weekend too - so I think I'd get loads of wear from them both. Given the amount of navy I wear the striped navy and red jumper would fit easily into my wardrobe to wear with jeans and boots through the colder months, an easy, no thought required combination. There's also the grey jumper with the embellishment on it, I'm not sure if the material could potential be an irritant to my eczema, but I think it's beautiful and well worth going in to store to check out. I didn't include this green jumper in the collage, because I'm not sure if it might be too high necked for my large chested figure, but it's that same gorgeous green shade that I love, so again I'll be heading into store to try it on! The last skirt is this gorgeous one from Warehouse, which again I think would go with a lot of my existing wardrobe. It's styled in store with a red jumper that has a slight puff sleeve, which I don't think would hugely flatter me, so I'll be on the lookout for other red jumpers with normal sleeves, but I think in the meantime it would match my own navy jumper, and again the swan print one. Lastly these culottes from Zara are gorgeous, the cropped length probably isn't ideal for winter but I think they'd be lovely for work with a plain top. I recently bought these ones from River Island but in a navy colour, rather than the cream, and I love them, so another pair would be a welcome addition to my wardrobe, and I love the colour of these Zara ones! Jewellery wise I initially saw this pearl necklace when we were in London, it's shown on the website as a choker, but when I saw it in the store it wasn't styled as a choker. What initially put me off was that you just tie it around your neck, it doesn't have a clasp and it's pretty overpriced for what is just a basic piece of costume jewellery , but to be honest I haven't stopped thinking about it. It's mainly the necklace I want, but the matching earrings are super pretty too, and pearls are always timeless. Shoes wise, these flat red ones are perfect for every day wear, the straps make them a little bit more interesting than a basic shoe but they're still casual enough for wearing with jeans and the striped jumper in the first collage. Lats but not least these burgundy shoes with their straps and chunky, block heel are ideal for every day - they'll be super comfortable for walking around in and I think I'll get a tonne of wear from them. 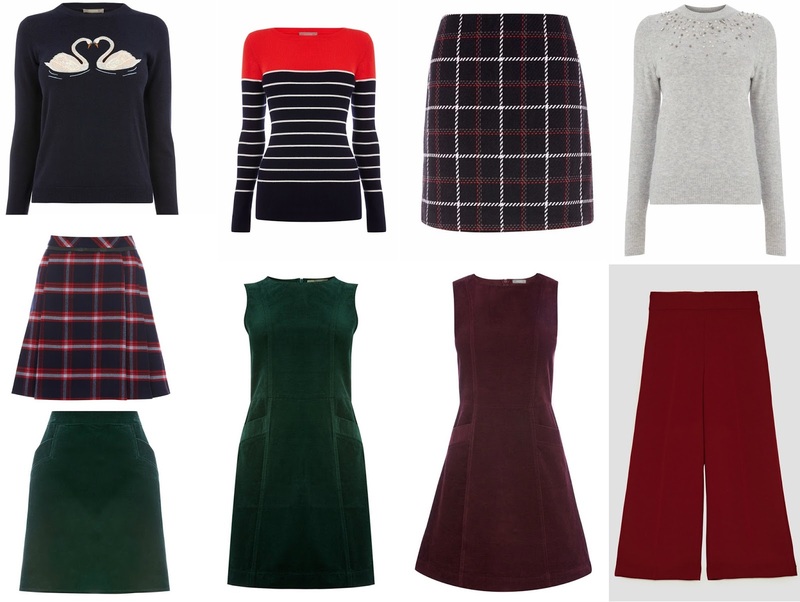 It wouldn't be an Autumn/Winter fashion wishlist without some party outfits for festive season. Dolce & Gabbana are pretty much my favourite designers - my instagram favourites collection is basically just their images and Elie Saab's - and these black and gold embellished shoes are just such a classic example of their maximalist approach to dressing. They're kind of hideous, in a wonderful way, and I love them. 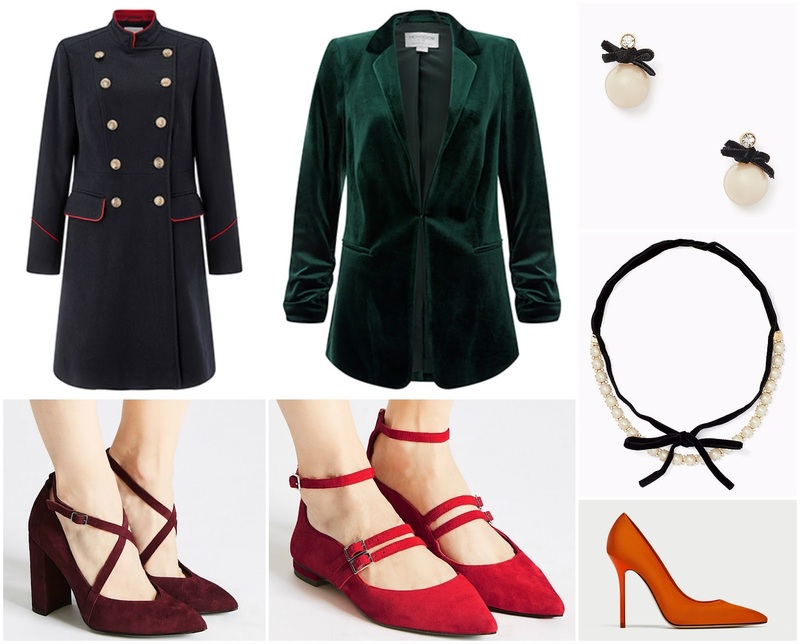 I thin this year I'd wear them with this classic black 50s skirt, and this black and gold velvet embroidered jacket from Zara, teamed with the black and gold headband I showed in this haul last winter. This jacquard skirt is gorgeous, and I think it would do really well for those Christmas drinks and dinners that aren't full parties but that I want to be a little bit more dressed up for - I could wear it with a plain jumper and flat shoes or even trainers to dress it down, or dress it up a little bit more, so it's something that would fit right into my wardrobe. The brocade boots are similar - they could be dressed up or dressed down. Paired with a midi dress they'd be perfect for the after work festivities, not OTT but with that little bit of effort, but throw on with jeans and a blazer and it's just a standard smart casual outfit, regardless of the season. 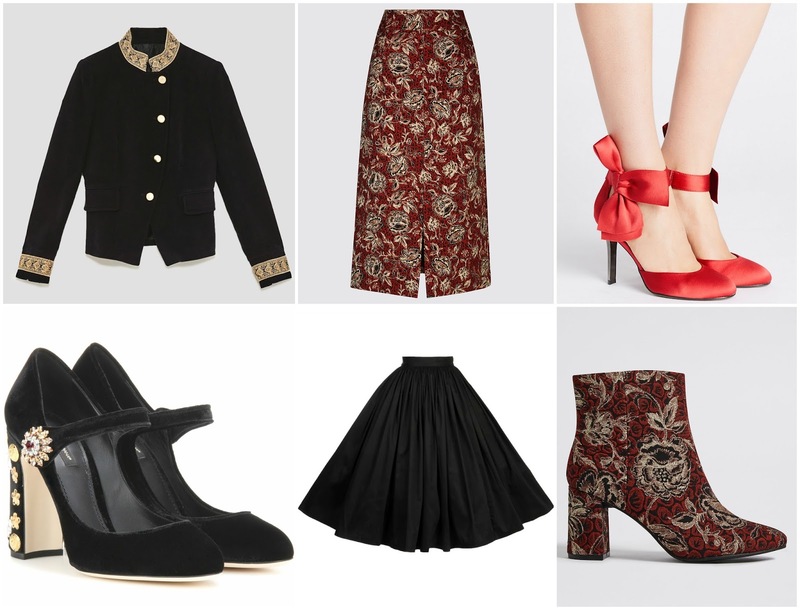 Lastly these bow heels are one of the most perfectly festive items ever, and I'm hoping they might go with my red Kate Spade bow backed dress I showed here. Even if they're not quite the right shade of red for that dress I wear a lot of red anyway, and I know these would get used. As for embellished boots, have you seen the floral embroidered ones on the Kate Spade website (which even come in leopard print)? If I was to come into some money tomorrow, they'd be the first thing I'd pick up.